Beans are healthy. Beans are delicious. But, best of all, beans are cheap. And when the winter wind bites, nothing soothes and warms like a hardy, veggie-ful soup. 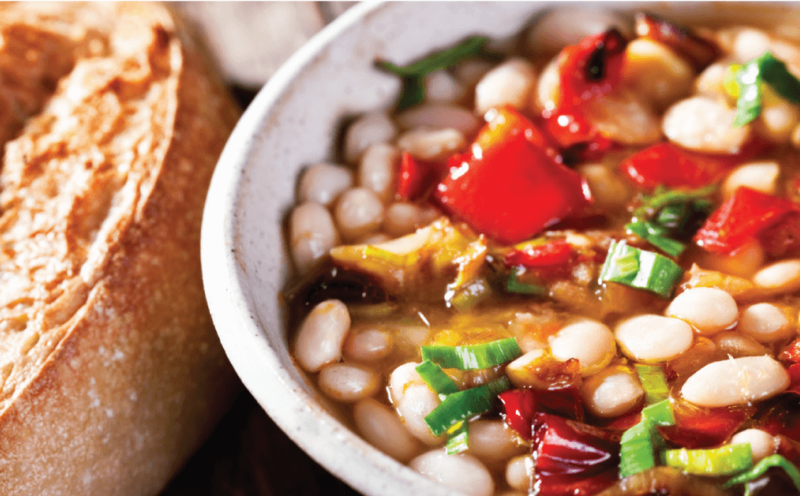 This recipe for Farmhouse Bean Soup brings together a host of inexpensive but nutritious ingredients for a dish that will be just the thing after you’ve braved the cold. Enjoy! Serves 6. Prep time: 15 minutes active; 30 minutes total. In a large pot, heat the oil over medium-high heat. Add the onion, carrots, parsnips and garlic and sauté 5 to 7 minutes. Add the tomatoes, broth and herbs and bring to a boil. Add the beans, reduce heat to simmer and cook 20 to 30 minutes until vegetables are tender. Stir in the spinach and season with salt and pepper to taste. Serve warm. Thanks to convenient and nutritious canned beans, this soup is a fast and tasty weeknight main dish. Just add a side salad and a plate of corn tortillas. The nutritional values and information are approximations, and ingredient costs are estimated. Happy New Year from Your Food Co-op!